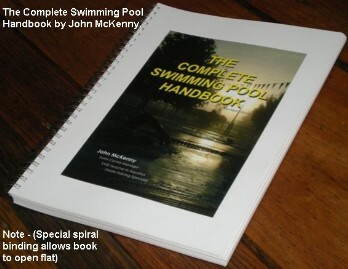 Available now, "The Complete Swimming Pool Handbook - revised" is a 200 page guide and reference to almost all swimming pool matters, including water testing, daily water quality problems, safety with chemicals including their storage, handling, addition, reasons for adding and all affects they will have, both good and bad. Its 29 chapters also cover many important topics such as design, water chemistry, backwashing, heating and winterising. Then there's a section containing over 40 ideas and suggestions for operating the pool safer, easier or cheaper, as well as a comprehensive section covering 'Terms, Phrases and Definitions' to assist with any further understanding needed. Have you had difficulty correcting pool water quality problems? There are over 30 pool problems with the corresponding practical way to fix them. "The Complete Swimming Pool Handbook" is used during our training and each paricipant receives a copy. It is also available for purchase separately for $70 (+ $15 postage if mailed). The best pool and spa book ever!! 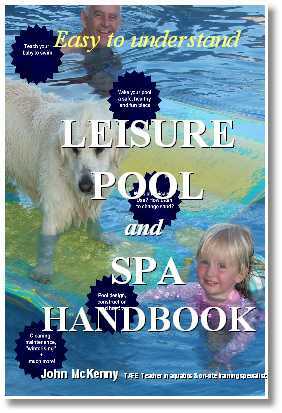 The Easy to understand LEISURE POOL AND SPA HANDBOOK. 14 UNDERSTANDING THE TERM "pH"
The complete guide to the efficient, safe and easy operation of the resort, semi-private or backyard swimming pool or spa. PLUS a full chapter discussing the simple steps to teach babies and infants water confidence and survival, with the author having over 30 years experience teaching infants and young children water safety. The Easy to understand LEISURE POOL AND SPA HANDBOOK is excellent value at $25. This includes GST postage and handling! Both books can be bought either on line, or just contact me and I'll sort something out that suits you!